then saying ‘next’. I believe my ability to understand and talk to people from all walks of life comes from the vast variety of jobs I have had…ski instructor, skip driver, brigadiers bodyguard, artist, council worker to mention but a few…and the one thing I have learnt is people want to escape from the treadmill of life and purchasing an ice cream is one way to do this. 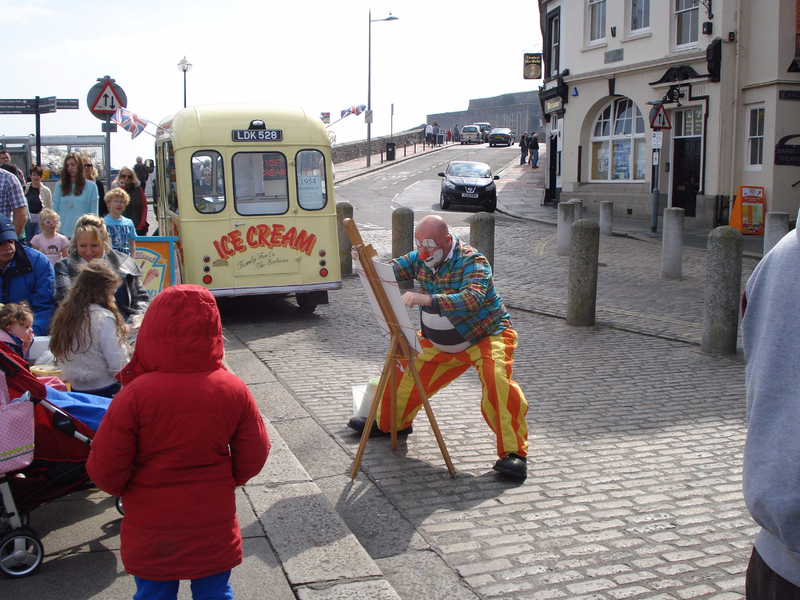 As well as selling ice cream I also dress up as a clown, Postman Pat… any outfit I can get my hands on and encourage street artists and performers to join me. Sutton Harbour is the ‘Covent Garden’ of the Westcountry. Such was my success and the complete enjoyment I got in selling ice cream that instead of using the proceeds from selling my home to purchase another house I decided to buy an ice cream van and continue living in bedsit like accommodation. I reasoned I could always buy a home later – so the search began. Mercedes, Transits, Uno’s – none of it really fitted and then I saw a Morris J ice cream van for wedding hire. Maybe, just maybe, it might be for sale! I phoned the owner and to cut a long story short, the final response was; ‘well what’s it worth to you?’ I would have given him my left arm if I did not need it for scooping! After an 8 hour drive I saw it in its full Pessangno regalia. This van in the flesh was a thing of beauty. My heart fluttered and he grabbed the moment and threw a price at me and I said yes….I said yes? That was my house! Did I just say yes? 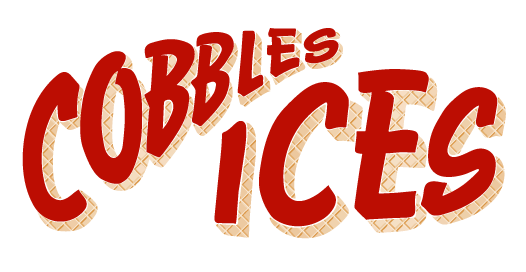 Primarily, I consider myself an artist and the design of the Cobbles Ices van was born from that generosity and inspiration I got from those humble beginnings and is now possibly the most photographed ice cream van in the country! Recently the Morris J had a painting done of it by the famous tv personality and renowned artist Timmy Mallet. My passion for vintage vehicles began with my use of 750 Truimph Tigers whilst being a member of the White Helmets Stunt Team. This passion has become an integral part of my business model. 8 years later I have done nearly 10,000 miles, as most journeys start with the comment, ‘you’re more than welcome to come and see it but I’m not sure if I want to sell it’ these leads mostly come from contacts and information collected over the 8 years. I have found that ice cream vendors are the most genuine and helpful community I have ever come across. Two months ago I decided to try and find and purchase the ‘Holy Grail’ of ice cream vans; A Commer Karrier Mister Softee. It is my understanding that there are only 25 of these original’s left in the world, so this was a tall order! At the end of two months, many false leads and finds that were too far gone to do anything with, I travelled 7 hours to Leeds to meet a real gentleman Ian ‘Whippy’ Smith, an authority on Commer Karriers, almost resigning myself to the fact I would never find one let alone buy one. On route I got a call from Phil Kelly to say that he might have a lead, no promises though. So, 20 mins spent with Ian, then a further 7 hour drive to the East coast eventually arriving at our hotel at 3 in the morning. On getting up taking a shower and using the hotels complimentary razor I managed to cut myself about 10 times. I now had bits of tissue stuck to my face and head! Not a good look when you want to negotiate. On arriving at Gary Suttons house, which is surrounded by 12 foot high hedge rows and an electric gate that you could not see through – I remember thinking (as is common on these journeys) What is he like? What condition is the van in? Does he have other stuff? Is this one for sale? My excitement gathered pace. When the gates rolled back I was stood looking like I’d done ten rounds with Edward Scissorhands and there stood the biggest man I have ever met with the character to match. Wearing a t shirt with a picture of one of the seven dwarfs with the words ‘I’m not grumpy’ I swear he actually looked like grumpy! In that instant I knew we were going to be friends for a very long time. Behind him on four acres of land was what a collector would describe as heaven. Row after row, after row of vintage vehicles in various states of restoration. I arrived at 10am and was shown around field after field of police cars, buses but mainly ice cream vans. It was 3pm before we got to the Commer Karrier. It was stunning. It was important not to react, he might decide to keep it or put the price up. Still there at 10 in the evening Sue, Gary’s lovely wife made us dinner. Having just endured the longest negotiations ever, I blurted out involuntarily; ‘Gary are you going to sell me this van?’ he paused and said ‘ah go on then’ just like that. I was exhausted but now a proud owner of an original 1962 Commer Karrier Mister Softee van! 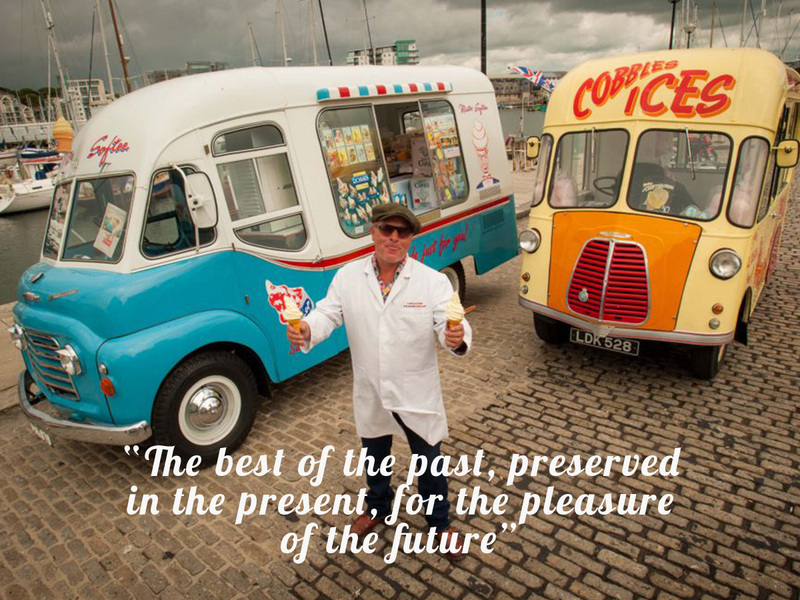 The van is now located next to the Harbour’s edge in Plymouth, it is fitted with an original 1960s clockface Carpigiani machine. 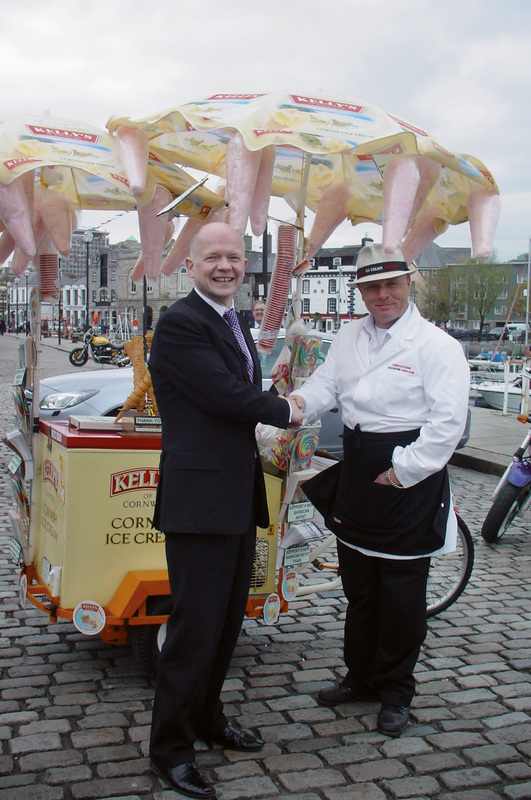 Michael plans to use renowned ice cream brands such as Kelly’s of Cornwall, Valenti’s of London and Tarr’s of Bristol to produce his whipped ice cream.